From Rock Rebel. 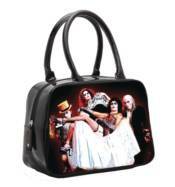 The cast of the cult classic film Rocky Horror Picture Show is depicted on a handbag! It is made with vegan vinyl with full zip enclosure.